This is an artwork I did earlier this year. You can check out the full view version in my DeviantArt Gallery. I haven't painted anything surreal for a long time so I decided to make such a piece today. I heard my sister is working on weird stuff for one of her clients. One of the things assigned to her is to illustrate a family with flames on their heads instead of hair. I thought that was kind of interesting so I decided to incorporate that idea in this latest piece that I've experimented with. This is my take on the subject matter. I chose a certain image as my reference. I don't really know why I chose a vintage family portrait rather than any other kind. It just popped into my mind. It was quite spontaneous and strange. I decided to incorporate that in this piece which was meant to be a little less usual. 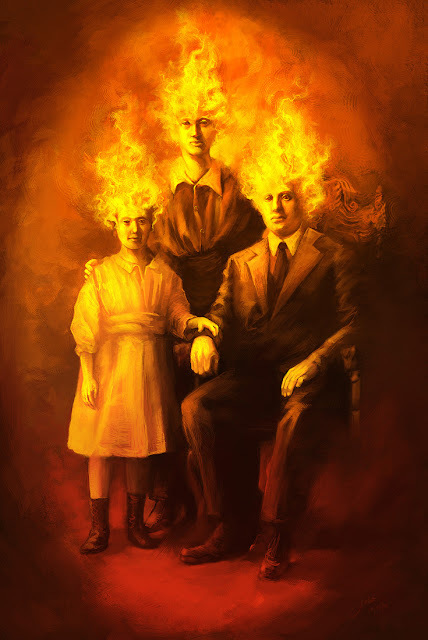 As I am writing this, I actually feel like my head is on fire. The weather here is so hot, I can barely stand it.